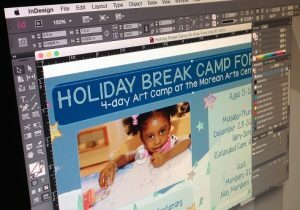 Learn Adobe InDesign, the software that is the standard for creating layouts for newspapers, magazines, newsletters, books, posters, CD and DVD covers, etc (the possibilities are endless). Basic principles of typography, design, and use of colors will be covered. Students will learn how to prepare files to send to a commercial printer. A basic understanding of Photoshop is recommended to take this class, but it is not essential.